The seventh entry in our A-Zdvent calendar is the Garden Egg chair by Hungarian designer Peter Ghyczy, which demonstrated new techniques for plastic production in the late 1960s. The Garden Egg chair was designed by Peter Ghyczy in 1968 during his spell as chief designer at plastics manufacturer Elastogran GmbH in the German town of Lemförde, where he lived following his emigration to escape the revolution taking place in his homeland. Ghyczy was tasked with developing products to showcase the creative potential of the company's polyurethane plastic and designed the chair with a curvaceous shell that would be difficult to manufacture using other materials. The plastic's imperviousness to water makes it suitable for use outdoors and the chair also features a lid that can be closed when not in use to create a watertight seal. A cushioned seat is positioned in the centre of the rounded plastic form, which curves upwards to form armrests on either side. When the lid is lifted up it supports a further cushion that acts as a backrest. The chair's smooth, glossy surfaces are typical of the space-age design that was prevalent at the time and made it an instant hit with the public, as well as a lasting icon of 1960s style. Curator Jana Scholze, who acquired an original version of the chair for the Victoria and Albert Museum's 2008 exhibition Cold War Modern: Design 1945-1970, said: "Its UFO form, portability, and suitability for informal lounging make it very characteristic of the period, reflecting the progressive, Utopian visions prominent in contemporary designs." Elastogran GmbH only produced a handful of the chairs as prototypes in Lemförde before setting up production in more affordable East Germany. It was manufactured for two or three years before production was halted due to the complexity of the lacquering process. Peter Ghyczy left Germany in 1972 and founded his own company in the Netherlands called Ghyczy Selection BV. 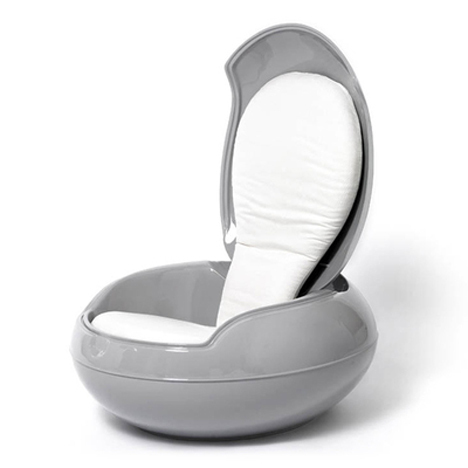 The firm recommenced production of an improved version of the Garden Egg chair in 2001, which is available in a range of interchangeable colour options for the seat and shell.